On Wednesday, September 16, the Black Student Union (BSU) had their first meeting of the year. The room was packed with students from various backgrounds and majors, all there with the similar purpose of networking with Black students on campus. The National Black Student Union was started in 1968, at the University of Washington, with students who were motivated by Stokely Carmichael. These students felt they needed a platform to voice their politically conscious minds. The students advocated for a Black studies program, and different branches of the organization were created at other universities. The meeting started with a presentation from Zebraa.com, a business that connects students to various companies for networking, employment and internships. 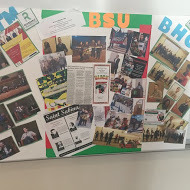 This served as a beneficial way to not only foster networking within BSU, but to benefit the students’ academic pursuits. The fall semester serves as an introduction for students new to BSU. The meetings during the fall semester will focus on various discussion topics, student voices, and what students can do to improve their lives, their campus, and their community. Jutae Steele, junior African American studies major, believes she found an organization with like-minded individuals. “I want to join BSU to be around other academically inclined Black people,” Steele said. The spring semester will be permeated with events. One of the first events is a possible movie screening of a film that depicts the imagery of Chicagoans and how the term “Chiraq” goes against that. The program will feature researchers and historians who can accurately depict the city. In February, BSU will celebrate Black History month with other students on campus. The theme this year is “Black People with a Purpose.” The goal is to counter the negative stereotypes of African-Americans portrayed in the media, bring awareness to the diversity of issues affecting the culture, and to fight against social injustices. In April, BSU will collaborate with the True Mentors organization for the second annual mentoring panel on success. The event was held last year with former NFL player Desmond Clark, CEO of Spartz Media, Emerson Spartz, and others who attributed mentoring to their success. This year, the panel will cater to the female demographic, with the panel scheduled to have mostly women. BSU president Ashanti McCall, senior psychology major is enthused about the upcoming year. Meetings will be held every second Wednesday of the month.